The Mount Pleasant Club is a friendly social club with a bar for members with games, events and live music. The club has an excellent reputation for its range of real ales, and also stocks a selection of cider, lager, wine and spirits. The Mount Pleasant Club is active in a number of Bradford on Avon leagues including skittles and darts. The club hosts entertainment for members and guests including live music, bingo, karaoke, seasonal events, and showcase nights. BINGO! Saturday 6th April & Saturday 4th May 2019. Blues Jam Sessions Sunday 14th April & Wednesday 17th April 2019. All welcome to join in Mark Green's afternoon music sessions. BAR STAFF NEEDED - new volunteers are needed to work behind the bar, pop in & leave a message for the committee. Full training & support given, along with a few perks to say thanks! New members are always welcome, please drop into the club for details. 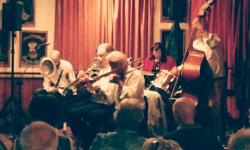 Friday 12th April 2019 - Savannah Jazz Band. Doors 7:30pm. Tickets £12. Friday 26th April 2019 - Jazz Giants feat Paul Harrison. Doors 7:30pm. Tickets £12. Ticket information: call Gerald on 01225 400959 or Basil Hazell at the club. Check back for news of more great live music. Ticket information: contact the club.